Adoption Agency CA: Interested In Adopting A Baby? Fill Out Our Application Form To Get Started! Interested In Adopting A Baby? Fill Out Our Free Application Form To Get Started Today! Adopting a baby may prove to be one of the best decisions you ever made, but this journey can include its number of challenges and stressors. Many adults seek to grow their loving family through private infant adoption, which can provide an ideal outcome for both adoptive and biological parents. If you are considering adopting a child, then A is 4 Adoption is here and ready to help! We strive to be your top source for assistance over any standard adoption agency across California, and will work with both expecting mothers and adoptive parents to find the best possible matches to provide the ideal outcome for the child. Our team is here and ready to help any time, so feel free to contact us to get started! 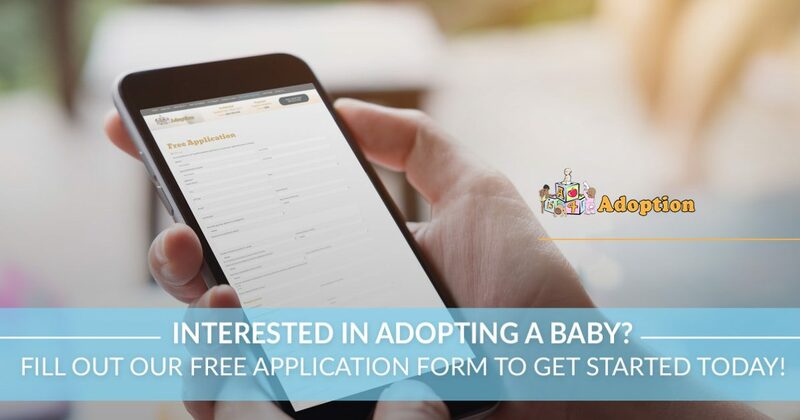 One way to start your adoption process is to fill out our free application form. Today, we’ll highlight a few categories to expect on our form, as well as the value of getting to know you. The basic info will be required to begin your free application, including you and your spouse’s names, address, phone numbers, and motivation for reaching out to us for adoption services. This data is vital for future correspondences, and will help to break the ice when our facilitators reach out to you. Our adoption center takes pride in finding the best matches for every family, and will work to pair you with an ideal birth mother to ensure a smooth process for everyone. You can provide your preferred gender and ethnicity, as well as when you are ready to start the adoption process. We will ask about your home study status (which is required!) to ensure your home and family are ready for a new child. We will also inquire about your race, age, hobbies, and interests to further establish who you are. We will ask what you and your spouse’s occupations are to help our birth mothers better understand how you earn a living. If one person stays at home, that is fine, and in many cases, may be preferred! The open adoption process enables expecting mothers to find a family that fits in with their religious beliefs. If you subscribe to a religious belief and are active in your religion, then be sure to fill out this section to help find an ideal match. Providing your marital status will provide our team and birth mothers with some insight into your family dynamic. Being single is perfectly acceptable, as well as domestic partnerships. A is 4 Adoption is proud to support LGBT adoptions, and will be happy to help loving families of all types! Many pregnant mothers look at education as a measure of success, and will be interested to learn about you and your spouse’s academic completions. Keep in mind that you do not need a doctorate to be a perfectly loving parent! It is essential to ensure that you are financially able to adopt a baby before proceeding. Our adoption center will be able to work with you to ensure you are ready for this amazing process, so be sure to answer our financial inquiries as accurately as possible. It is beneficial to tell us about your current children to determine the best fit for your loving family. We would like to know if your kids are biological or adopted in order to give our birth mothers a better picture of your family dynamic. Answering these questions honestly won’t disqualify you from adopting a baby through our center, but it will help give us a clear picture of your full background. Existing health conditions, delays on child support, previous psychiatric care, and more will need to be disclosed fully before the adoption process can continue. A is 4 Adoption is here to help prospective parents begin their journey. Our adoption center was founded after our owners faced the stress, uncertainty, and long waiting periods associated with this complex process. If you’re looking for a high-quality adoption agency in California to adopt a baby, then turn instead to our facilitators for an ideal match and comprehensive support every step of the way. If you’re ready, then feel free to fill out our application form here, or contact us online to learn more about our complete approach to domestic adoption. Our adoption center has babies in need of loving homes, and our team is ready to start your journey. We look forward to hearing from you!